These Scrapbooking Grandmother Quotes will help you to convey the wealth of feeling you have for your beautiful Grandma in your scrapbook mini albums and layouts. God bless our grandmas! My name is 'NO NO' but Grandma calls me precious. Grandmothers are just 'antique' little girls. 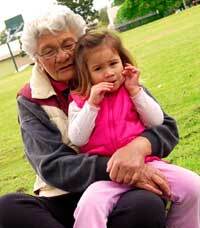 A Grandmother is admired for her wisdom, patience, understanding and her chocolate chip cookies.